Audrey Hepburn, known for her starring roles in films such as Roman Holiday, Breakfast at Tiffany's, and My Fair Lady, dedicated the last years of her life to helping children in need around the world. Audrey had the reputation of being a humble, kind and charming person, who lived the philosophy of putting others before herself. She showed this side particularly towards the end of her life in her work for the United Nations Children's Fund (UNICEF). 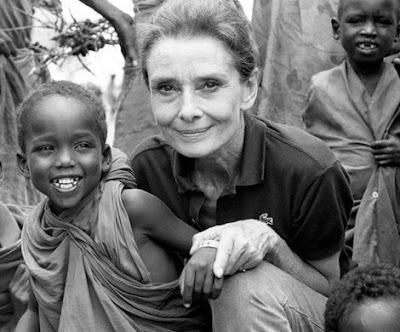 When Audrey Hepburn became a UNICEF ambassador, she went on a mission to Ethiopia, where years of drought and civil strife had caused terrible famine. After visiting UNICEF emergency operations, she talked about the projects to the media in the United States, Canada and Europe over several weeks, giving as many as 15 interviews a day. It set a precedent for her commitment to the organization. 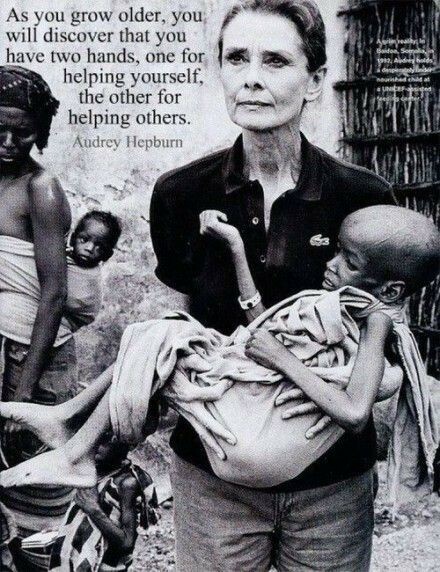 Hepburn received the United States' highest civilian award, the Presidential Medal of Freedom, in December 1992. During that year, though ill with cancer, she had continued her work for UNICEF, traveling to Somalia, Kenya, the United Kingdom, Switzerland, France and the United States. Audrey Hepburn, is a true inspiration to every generation, and even after her death, her legacy of service and philanthropic mission continues in perpetuity.